It took 47 years, but Robert Drasnin finally came out with a follow-up to his 1960 exotica masterpiece Voodoo. Drasnin was not as well known as others making exotic music during the late 50’s and early 60’s. His album was one put out on a smaller label and for the most part fell through the cracks. But the music on the album was just as haunting and imaginative as anything Martin Denny or Les Baxter could have put out. During the lounge and exotica revival of the 1990’s, Drasnin's music was rediscovered. Modern tiki music fans knew his music has withstood the test of time and wanted to share it with other fans. Using near mint copies of the album, a CD was made from it released by Dionysus records in the mid-90's. Fast-forward to 2005. Drasnin was invited to play the tiki event the Hukilau. He not only played through his classic album, but he lit the spark to the possibility of making a new album. He went into the studio recorded what would become Voodoo II. This album is a wonderful mix of classic exotica with modern sensibilities. The ghost of “Quiet Village” is there, but everything sounds fresh and new. Drasnin is not trying to recreate any past glory here. He’s taking his music to the next step. Voodoo II is a natural extension to the first album it is like no time has passed between the two. 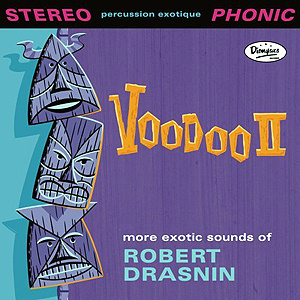 With Voodoo II, Drasnin has secured his place in the pantheon of tiki music gods. He has also created one of the richest, most textured exotica album to come out in a while.